There are 15 comments for this item. What ? No Bosco ? It was an alternative to Nestles Quik (powder) that we kids drank. Dad preferred Ovaltine......I wasn't too thrilled with Ovaltine. Rarely we used U-Bet chocolate syrup.....not often. Mixed it with seltzer and a bit of milk to make an Egg-Cream. My Aunt used 7-Up instead of seltzer in her Egg-Creams.....that tasted like a sweeter Egg-Cream ! Yes! Bob K.."Yumberry"was made by the same company that created and sold"CocoMarsh". I liked "YumBerry"..I don't think that it was that bad. Does anyone here at The Baby Boomer eMuseum remember "Bosco Bear"? Was the same company that made Cocoa Marsh make Yumberry? Pretty terrible tasting stuff. Just my opinion but I always thought cocoa marsh was the best chocolate drink mix ever, even though I was just a kid when I last remember it. I never liked white milk but mixed with some cocoa marsh it was the best !!!!!!!!!! BOY! Do I remember the Bosco! I'm 61 yrs. old, but I well remember my pre-teen years, when I drank Bosco. I even remember how it tasted! I even recall putting it in my cereal back then. While we are on the subject of Food, Candy, Drinks, a couple of things I miss the most is RC cola and moon pies. I remember I used to buy one of each and it would cost 15 cents for both! Thanks for the memories! I loved Bosco, it was rich and chocolate-ty. Chocolate flavored Bosco was mighty good for me. Mama put it in my milk for extra energy. Bosco gave me iron, and sunshine Vitamin D.
Oh, I loved Bosco - that was the drink for me! When I was a little kid I thought that Bosco was a great dip for potato chips. I remember watching BOZO the Clown and the commercials for Bosco. This was my favorite chocolate syrup when I was a kid. 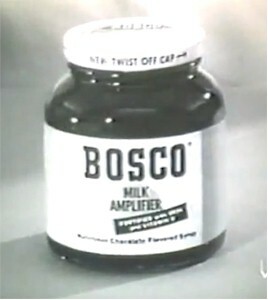 Bosco had by far the best flavor of the commercially available chocolate syrups back in the 1940's. I think Hershey's was its closest rival, but there was also one called Cocoa-Marsh, which included liquid marshmallow in its formula.